Stephen Williamson: New Monetarist Economics: What is full employment anyway, and how would we know if we are there? What is full employment anyway, and how would we know if we are there? What are people talking about when they say "full employment?" Maybe they don't know either? Whatever it is, "full employment" is thought to be important for policy, particularly monetary policy. Indeed, it typically enters the monetary policy discussion as "maximum employment," the second leg of the Fed's dual mandate - the first leg being "price stability." Also in an interview on Bloomberg, Narayana gives us the policy conclusion. Basically, he thinks there is still "slack" in the economy. My understanding is that "slack" means we are below "full employment." So what is Narayana saying? I'm assuming he is looking at payroll employment - the employment number that comes from the establishment survey. In his judgement, in a "steady state," which for him seems to mean the "full employment" state, payroll employment would be growing at 1.2M per year, or 100,000 per month. But over the last three months, the average increase in payroll employment has exceeded 200,000 per month. So, if we accept all of Narayana's assumptions, we would say the US economy is below full employment - it has some catching up to do. According to Narayana, employment can grow for some time in excess of 100,000 jobs per month, until we catch up to full employment, and monetary policy should help that process along by refraining from interest rate hikes in the meantime. Again, even if we accept all of Narayana's assumptions, we could disagree about his policy recommendation. Maybe the increase in the fed funds rate target will do little to impede the trajectory to full employment. Maybe it takes monetary policy a period of time to work, and by the time interest rate hikes have their effect we are at full employment. Maybe the interest rate hikes will allow the Fed to make progress on other policy goals than employment. But let's explore this issue in depth - let's investigate what we know about "full employment" and how we would determine from current data if we are there or not. Where does Narayana get his 1.2M number from? Best guess is that he is looking at demographics. The working age population in the United States (age 15-64) has been growing at about 0.5% per year. But labor force participation has grown over time since World War II, and later cohorts have higher labor force participation rates. For example, the labor force participation rate of baby-boomers in prime working age was higher than the participation rate of the previous generation in prime working age. So, this would cause employment growth to be higher than population growth. That is, Narayana's assumptions imply employment growth of about 0.8% per year, which seems as good a number as any. Thus, the long-run growth path for the economy should exhibit a growth rate of about 0.8% per year - though there is considerable uncertainty about that estimate. For the last couple of years, employment growth has been falling on trend, by both measures. But currently, establishment-survey employment is growing at 1.6% per year, and household survey employment is growing at 1.0% per year. The latter number is a lot closer to 0.8%. The establishment survey is what it says - a survey of establishments. The household survey is a survey of people. The advantages of the establishment survey are that it covers a significant fraction of all establishments, and reporting errors are less likely - firms generally have a good idea how many people are on their payrolls. But, the household survey has broader coverage (includes the self-employed for example) of the population, and it's collected in a manner consistent with the unemployment and labor force participation data - that's all from the same survey. There's greater potential for measurement error in the household survey, as people can be confused by the questions they're asked. You can see that in the noise in the growth rate data in the chart. This chart looks at the ratio of household-survey employment to establishment-survey employment. Over long periods of time, these two measures don't grow at the same rate, due to changes over time in the fraction of workers who are in establishments vs. those who are not. For long-run employment growth rates, you should put more weight on the household survey number (as this is a survey of the whole working-age population), provided of course that some measurement bias isn't creeping into the household survey numbers over time. Note that, since the recession, establishment-survey employment has been growing at a significantly higher rate than household-survey employment. So, I think that the conclusion is that we should temper our view of employment growth. Maybe it's much closer to a steady state rate than Narayana thinks. But, on to some other measures of labor market performance. This chart shows the labor force participation rate (LFPR) and the employment-population ratio (EPOP). Here, focus on the last year. LFPR is little changed, increasing from 62.9% to 63.0%, and the same is true for EPOP, which increased from 59.8% to 60.0%. That looks like a labor market that has settled down, or is close to it. So, by this measure the labor market is at its tightest since 2001. Job openings are plentiful relative to would-be workers. In the chart, U3 is the conventional unemployment rate, and U6 includes marginally attached workers (those not in the labor force who may be receptive to working) and those employed part-time for economic reasons. The U3 measure is not so far, at 4.7%, from its previous trough of 4.4% in March 2007, while the gap between current U6, at 9.2% and its previous trough, at 7.9% in December 2006, is larger. Two caveats here: (i) How seriously we want to take U6 as a measure of unemployment is an open question. There are problems even with conventional unemployment measures, in that we do not measure the intensity of search - one person's unemployment is different from another's - and survey participants' understanding of the questions they are asked is problematic. The first issue is no worse a problem for U6 than for U3, but the second issue is assuredly worse. For example, it's not clear what "employed part time for economic reasons" means to the survey respondent, or what it should mean to the average economist. Active search, as measured in U3, has a clearer meaning from an economic point of view, than an expressed desire for something one does not have - non-satiation is ubiquitous in economic systems, and removing it is just not feasible. (ii) What's a normal level for U6? Maybe the U6 measure in December 2006 was undesirably low, due to what was going on in housing and mortgage markets. To collect UI requires having worked recently, so this reflects the fact that few people are being laid off - transitions from employment to unemployment are low. An interpretation of what is going on here is that the short-term and long-term unemployed are very different kinds of workers. In particular, they have different skills. Some skills are in high demand, others are not, and those who have been unemployed a long time have skills that are in low demand. A high level of long-term unemployed is consistent with elevated readings for U6 - people may be marginally attached or wanting to move from part-time to full-time work for the same reasons that people have been unemployed for a long time. What's going on may indicate a need for a policy response, but if the problem is skill mismatch, that's not a problem that has a monetary policy solution. So, if the case someone wants to make is that the Fed should postpone interest rate increases because we are below full employment - that there is still slack in the labor market - then I think that's a very difficult case to make. We could argue all day about what an output gap is, whether this is something we should worry about, and whether monetary policy can do much about an output gap, but by conventional measures we don't seem to have one in the US at the current time. In terms of raw economic performance (price stability aside), there's not much for the Fed to do at the current time. Productivity growth is unusually low, as is real GDP growth, but if that's a policy problem, it's in the fiscal department, not the monetary department. But there is more to Narayana's views than the state of the labor market. He thinks it's important that inflation is still below the Fed's target of 2%. Actually, headline PCE inflation, which is the measure specified in the Fed's longer-run goals statement, is essentially at the target, at 1.9%. I think what Narayana means is that, given his Phillips-curve view of the world, if we are close to full employment, inflation should be higher. In fact, the long-run Fisher effect tells us that, after an extended period of low nominal interest rates, the inflation rate should be low. Thus, one might actually be puzzled as to why the inflation rate is so high. We know something about this, though. Worldwide, real rates of interest on government debt have been unusually low, which implies that, given the nominal interest rate, inflation will be unusually high. But, this makes Narayana's policy conclusion close to being correct. The Fed is very close to its targets - both legs of the dual mandate - so why do anything? A neo-Fisherian view says that we should increase (decrease) the central bank's nominal interest rate target when inflation is too low (high) - the reverse of conventional wisdom. But maybe inflation is somewhat elevated by increases in the price of crude oil, which have since somewhat reversed themselves. So, maybe the Fed's nominal interest rate target should go up a bit more, to achieve its 2% inflation target consistently. 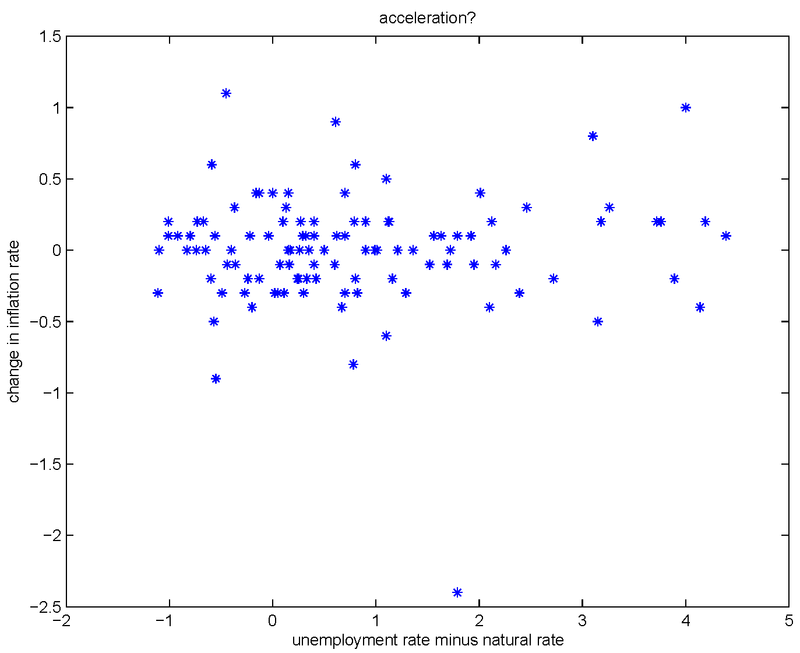 According to standard Friedman Phillips-curve logic, we should see a negative correlation in the chart, but the correlation is essentially zero. One thing I wonder about is the possibility that policy implementing economists are a bit insulated from reality. It seems possible their personal experiences might reinforce a feeling that everything is all right. Meanwhile countervailing data may subconsciously be given short shrift. A shrinking middle class, stagnant wages, declining labor force participation of adult males all seem ignored. Could it be argued that full employment is characterized by a robust and growing middle class? Economics is both a hard and social science and social criteria may belong in the definition of full employment. Is it wise to try to throttle growth as soon as policy mandates are achieved, thus seeking to maintain a virtuous steady state equilibrium? Might it not be better to attempt more of a sine wave economic policy, deliberately overshooting targets to bring the marginal sidelined workers into the economy where they can gain experience and then, if necessary, briefly overshooting constraining measures to quickly contain possible excesses? 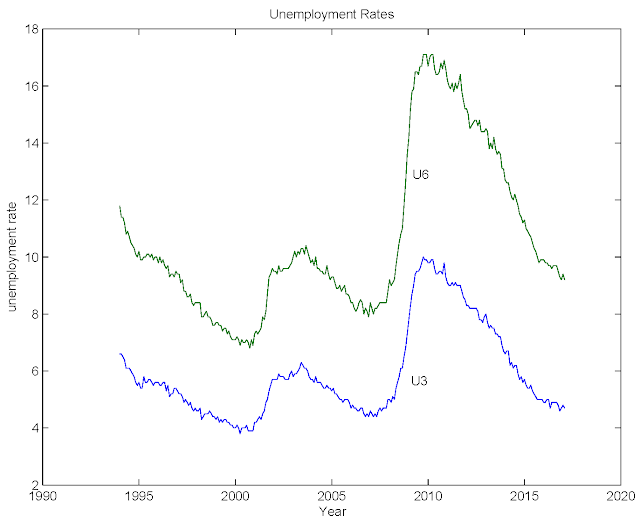 Didn't the causality in Friedman's Phillips curve run from higher than anticipated inflation to lower unemployment, not the other way round (unemployment -> lower inflation, which seems to be the most common interpretation that I've seen in my short life)? Neither I think. You could read Friedman's 1968 AER paper to see what he actually said, but my memory is that he was thinking about the effects of monetary policy. 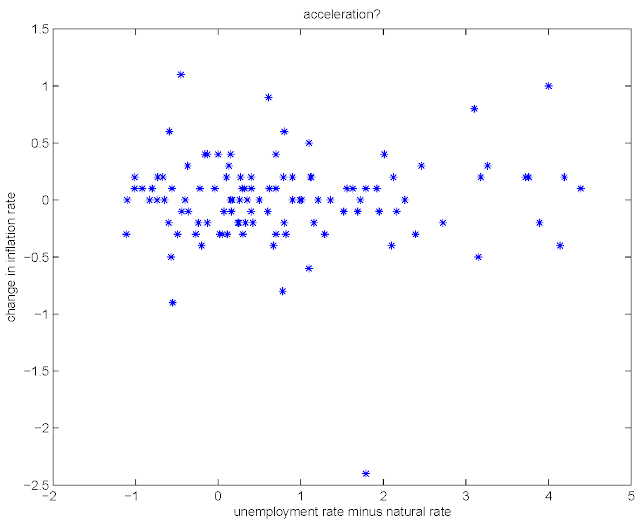 So, monetary policy can cause an inflation surprise which coincides with an unemployment surprise. But, sometimes central bankers will slip into the "unemployment causing inflation" causality story. They'll tell the story the other way too - like Friedman.